Collin Hansen: If anything distinguishes evangelicals from other religious groups, it’s Bible study. And yet, you wonder sometimes if it’s something we like to talk about more than do. Unless it’s debating things like creation, it’s always a favorite past time for evangelicals of all ages. Jen Wilkin is a gifted Bible teacher and veteran advocate for biblical literacy in the church, and she’s not afraid to tackle the hard topics, which start on the very first page of scripture and continue all the way through the end, from Genesis to Revelation. Wilkin’s latest Bible study published by LifeWay is “God of Covenant: A Study of Genesis 12-50.” She joins me on the “Gospel Coalition” podcast to talk about Genesis, Bible teaching, parenthood, Christian education and everything else we can cram in. Thank you, Jen, for joining me on the Gospel Coalition podcast. Wilkin: Thanks for having me on, Collin. Hansen: Well, Jen, you’ve been teaching the Bible for years, but not always in front of a camera or in a large crowd of women. What was your first experience teaching the Bible? Wilkin: Oh, gosh. My very first experience is probably during college. I taught a small Bible study to a group of friends. And I don’t know that I did a very good job of it, but it was my first attempt. And I remember we did go through a book of the Bible, we did Philippians. And it wasn’t until I had gotten out of college and was living in our first community in Houston and became a member of a church there that I started teaching in a more formal setting. But yeah, started in a living room with some girls in college. Hansen: When did you know it was something you wanted to do with your life? And so, I think, you know, my earlier experiences were…just felt more like facilitating a discussion because it was in a living room, but I had in fact been teaching instead of facilitating. So, basically, I’m the worst small group leader you could ever want [inaudible 00:02:36]. And I knew that I could teach things. Like, I knew that I enjoyed being on the platform explaining something and then it felt comfortable to me whereas it was terrifying to other people. But in terms of teaching the Bible, I think it took me a little time to connect that that was my sweet spot, that that was the thing that was just gonna become like a compulsion almost for me. Hansen: One of the things that you’re known for is being able to encourage people to think about their Bible study and not merely to just feel and to emote how they react to what they’re encountering in there. How did that perspective and that sort of calling…how did that coalesce for you? Wilkin: Well, I became the women’s ministry director at my first church out of college. Eventually, I got into that spot. And one of the things that I was responsible for was vetting the curricula that were being used in anywhere between 12 and 14 women’s Bible studies that were going on in any given semester. And at point, I began to see that women in particular…but I would say over the last 10 or 15 years is not just women, but at that point, women, in particular, were being resourced almost entirely at the feelings level. And then I found my way honestly into a preset Bible study at one point, and that was a place that connected what I had learned as an English major in college with the Bible. They were giving people tools to become more proficient in handling the Bible on their own which doesn’t mean that we don’t handle the Bible in community and under teaching, but that we should come into those discussions having spent some time to test ourselves and doing some work. And that was so appealing to me because it was not currently being offered on a broad scale to women in particular. And so, I’ve started trying to write my own materials that were capturing the best pieces of an inducted Bible study, but perhaps making them a little more accessible to the average church attendee and then combining them with teaching that was to bring the text to life. Hansen: You mentioned one person who helped you to realize and to understand that gifting there. Are there some other mentors who helped you as you learned to study the Bible and then ultimately then to teach it? Wilkin: Oh, yeah. I mean, I was mentored from a distance by R.C. Sproul. We used to set aside money and save so that we could go to the Ligonier Conference when it would swing through town, and we listened to his tapes, through his tape ministry. And I would say that his teaching style had a profound impact on me because he was so good at taking these profound truths and then putting them into simple speech for the average listener and without sacrificing any of the quality of what it was he was wanting to communicate. And so, that was very impactful to me, just in terms of getting ideas into the hands of people. But then, I did have a mentor, Pat Conner, she’s still a dear friend who helps me develop more than just a love for teaching but a love for the people that I was teaching, and that was a big connection point that I needed to make because it’s not enough to be a lover of theology. You have to love people who need that theology, or you’re gonna communicate it in ways that are unloving. And she was so great at helping humanize the teaching task by helping me to see how, you know, you can teach this doctrine, but you’re teaching it to people who are going through this situation or that situation, and so how will you teach it in a way that it gives life versus, you know, bearing them down under even a greater weight. Hansen: Let me shift gears a little bit, but stick generally though within the category of Bible study. You and Jeff had four kids in four years, wondering especially in those early years, what spiritual life looked like as a family, maybe for you specifically, and what role Bible study played during that time? Wilkin: Well, you know, Collin, we insisted on getting up and gathering every morning for hymn singing, and then we would speak words of grace over one another, no, I’m completely kidding [inaudible 00:07:10] get off of it for a number of years, and I would say family discipleship. So, what I’ve learned as the kids have now grown up and moved away, when your kids are little, you have a high frequency of opportunities to have a devotional time, but you’re going to have a low amount of depths that you can get into. When your kids are little, you’re gonna have a prayer that you say together, or you might talk about one thing before bedtime, and it probably happens almost every night of the week because…at least in our case, we didn’t have much of a life at that stage. As they get older, the frequency of times that you’re having those kinds of conversations formally is dropping, although I believe that informally you begin to just have them as a matter of course. They just become sort of the language of your home, hopefully. But you have fewer sort of scheduled times where you’re sitting down as a family to talk about those things, but you’re able to achieve much more depth in those conversations. So, I would say in the early years, we were repeating prayers together and then as they got older, teaching them to sort of own those prayers and to involve different aspects, praying for one another, and by the time everyone could read, we started asking the kids to come having read a portion of whatever book we were going through and they were supposed to bring two observations and two questions, and that would pretty much take up all of the dinner time conversations for that night. And then over time, I would say, by the time they were seniors in high school, around that age, we weren’t even necessarily having a scheduled time anymore, but it was just a matter of conversation to talk about spiritual things together. Hansen: Well, I think we could imagine a number of different myths of Bible study related to parenting there. But taking the perspective out a little bit, what would say is the biggest myth you commonly hear from American Christians when it comes to studying the Bible? Wilkin: Oh, definitely that is should be easy. Yeah, we think it should just because God wants me to know Him, I should just be able to open the Bible, and it will yield itself up to me with no effort on my part. You know, we have an understanding of how the Spirit speaks to us through the Word on the page, but we build some assumptions around that that it will just magically happen. And yet, I believe it’s in 1 Peter where Peter talks about how we’re to crave the pure milk of the Word like newborn infants. And it’s a nursing reference. And I always bring it up in rooms of all men to make them incredibly uncomfortable. But, you know, anyone who has firsthand experience with nursing knows that it’s a natural thing and it’s a necessary thing, but it isn’t an easy thing. It’s an acquired skill for the baby. And the same is true for the Christ follower; the Bible is natural and necessary. You can’t imagine anything that’s more natural and necessary for our development, but it is still a skill that we acquire in order to grow and to flourish. And the same is true with Bible study. It’s not that there aren’t things that you can or may be able to take immediately from the text, but it’s that there’s so much more that you can take from it as you learn and grow in the discipline of coming to the scriptures. Wilkin: It makes me ask a dangerous question, just preparing you, preparing you, I know what could go wrong. There’s nobody listening to this, so don’t worry about it, just you and me. We assume that the best way, like the more you read, the better off you are, go through your daily plan, go through your yearly plan, all sort of stuff. Is it possible though for that in some ways…you know, I’m avoiding being hyper-spiritual here that’s why this is dangerous, that that could actually discourage you if, for example, you end up reading the same things over, and over, and over again, but don’t developed it all in your comprehension. One of the problems that I run into is that the way my mind works, especially I try to use the same print Bible, always, because there are so many tactile ways that my memory will go to a certain place on a page, and then I will remember. Like, I can tell you where on there, and that really helps me with retention. The problem is it gives me another issue. That issue is that my mind tells me, “Oh, you know, how this story goes,” and you just jump over it. And so, I may read, and read, and read, and in some ways, it actually discourages me sometimes because I’m not developing at all. And then sometimes, I’ll just invest a little bit of time in some kind of aid or resource that will take me deeper. Actually, it’s interesting, Jen, the best way for me to retain is to teach. Hansen: Because when I have to teach it, all of a sudden, I force myself to read a totally different way, and I notice a million different things. So, the dangerous question is, is it possible that reading the Bible sometimes in certain ways could discourage you? Wilkin: Well, I think, you’re asking a question that has to do with diagnosis of where we have been spending most of our time. And so, it may be that in your case you’ve done a lot of just Bible reading and not a lot of deep dives. What is more commonly the case is that neither the Bible reading plan or the deep dive has been attempted, but instead it’s been all topical or devotional type resources. And almost without exception what I find is that people have…they started by dipping their toe in the water on topical studies, and then they devolve into a pattern of doing only topical studies. And topical studies are meant to be layered on top of Bible reading plans and deep dives, having just a firsthand knowledge of the text. And so, depending on what environment you’ve been in, it’s possible that maybe all you’ve done are deep dive Bible studies, although I haven’t met a lot of those people. I do hear that they’re out there. Well, that you’ve only done devotionals, or it’s possible that you’ve been so fixed on reading plans that you haven’t given enough time to other approaches. And so, rather than say, “Here is the right way to do it,” I always want to ask people do an inventory of where you’ve been spending the bulk of your time and ask if you might need to implement another tool. Hansen: Yeah. I would say there’s two, kind of, great leaps forward that I’ve had in my Bible knowledge. And the first of them and just understanding of God through His Word. The first was in college, I was on a cruise summer project and just had a lot of time that was relative undistracted, in an affirming environment to simply read the Bible. Just one of those old, just little…I mean, nothing fancy, handout kind of thing, and just digesting it there, so just getting familiar with the contents. And the second time was the first time I went through…I think I probably did modified McCheyne plans, but I did that right before going to seminary, worked out really well because then it bled into the kind of biblical theology I was learning from Don Carson, and Graham Cole, and others, but the McCheyne study reinforced the connections between the Old Testament and the New Testament, that plan. And so, it has made a difference. I mean, there’s no substitute for simply knowing the content. Just having it there, just reading it, and like you said not just dipping in on that basis, but it seems like at some layer in so far as it’s possible for us, we have to continue to challenge ourselves to see what’s there. Wilkin: Well, sure, familiarity breeds contempt. I would say in this case, it just breeds boredom. And this is actually one of the reasons that I’m so committed to revisiting books of the Bible that people kind of think they know because we have, you know, we have like a felt board understanding of a lot of these books, and we don’t even realize that we’ve heard them taught. And in some cases…so, I’m a little fastidious about this, I’m not prescribing this, but I don’t like to make notes in my Bible because I fear that when I go back and read that passage again, I’m gonna dock my eyes over to that note, and remember the sermon that I heard over it, and then not push myself to read anything additional into the text. I always hear that one sermon over and over again. Hansen: I stopped doing that, Jen, for the same reason, same reason. Wilkin: And I get that people’s brains work different ways. Like, I would never say, “Don’t write in your Bible,” but for me, personally, I knew that I didn’t wanna only always remember that one teaching that I had heard. Hansen: Yeah. No, I think that makes a lot of sense. You’ve obviously at this point written a number of Bible studies. You’re now finished with the entire book of Genesis, one of those books that we think we’re familiar with especially in that felt board way and in particular those early chapters. Explain to us what your writing process for a Bible study looks like including how you choose the book that you want to teach? Just how do you project out those kinds of things? I mean, because when you’re committing to teach something like Genesis and to write a Bible study on all of Genesis, that’s no small undertaking. Wilkin: Well, Genesis is a no brainer because it’s the first book in the Bible, and it’s the one where all of the themes that are gonna be carried throughout the rest of the Bible are introduced. I say that it’s a no brainer, but also I had never studied it until I set out to teach it. I’d never studied the entire thing. And so, I don’t think that we frequently teach it, and that’s related to another issue in the church and that is just that we don’t often allocate enough time in church calendars to cover books that are much longer than five chapters. And the first 14 books of the Bible, of those first 14 books, there is only one book that would lend itself to a four to six weeks study, and that’s the Book of Ruth. And I would imagine that most of the women in our churches have studied that book multiple times. But if you think about the most heavily traveled books in the Bible in terms of Bible study, almost without exception, they’re the shorter ones that fit neatly into a low expectation of what people will opt into. And so, people have studied Ephesians multiple times, but when are they gonna set aside time to do 50 chapters in Genesis. And so, I really wanted to pull the women who were doing all of these studies that I published are coming out of my on-the-ground teaching environments. And I knew that the women that I was teaching, they felt like they knew the New Testament really well, but they were fuzzy on the Old Testament. But the reality is that if you don’t know the Old Testament then you don’t really have a depth of understanding on the New Testament because the New Testament writers are wanting to point you to Old Testament ideas constantly. So, I wanted to get the women in my study, in my living room, honestly, at the time that I wrote this, I wanted to get them into those most foundational stories and passages so that the rest of the Bible would come alive for them in a way that it perhaps hadn’t yet. Hansen: Well, how have you seen that happen? What are some of those moments in Genesis, in particular, that really make people’s eyes open when it comes to the character, the self-revelation? Wilkin: Oh, I mean, there’s so much just in Genesis 1 through 11, just the creation account. One of the things in the creation account that I think was most revelatory is they were all familiar with the passage that says, “If anyone is in Christ, he is a new creation.” But once you start studying the creation account and you start to piece together…oh, wait a minute, Paul uses that term “new creation” with a lot of intent. Like, he would have expected that he would cue up your ideas of that first creative act in Genesis 1, and then you start to be able to see how all of these imagery, the imagery around light and darkness, fruitfulness and multiplication, and all the other themes, the separation of waters from waters, and day from night, and how all of these themes are showing up in the way that we think about the church, and in the way that we think about ourselves that if I’m a new creation in Christ, I have been brought from darkness to light, I’ve been called to be separate and set apart, the result of that creative work in me is fruitfulness and multiplication. It’s ruling and subduing, and ultimately, there will be rest. And so, that for a lot of the women was just like, “Oh, my goodness. This has been here this whole time,” but because we’re only living in the New Testament often, we haven’t connected that all of these words have been chosen with great intent to point us toward these big stories. Hansen: It seems like a theme for your “God of Covenant” study from Genesis 12 to 15 is Genesis 18:14, the question, is anything too hard for the Lord, how do you find that to be an appropriate theme verse for Genesis 12 to 50? Wilkin: Oh my goodness, I mean, Genesis 12 to 50 is taking us through all of the Spanish soap opera story of the lives of the patriarchs, and you read their stories and you’re simultaneously grateful that they are being humanized and grateful that God just perseveres. You know, it’s just it’s a story of his faithfulness no matter what these people do. And that’s a huge reassurance for the believer. And then again, the question is anything too hard for the Lord on a very…this individual level, I mean, it’s a question for the church certainly, but on an individual level, it is a question we will all face if we haven’t faced it already. And we find it answered with quite a bit of finality in the Gospels when the birth of Jesus is announced and the angel says, “For nothing is impossible with God.” And so, again, it’s one of those situations where we go back to these earliest pages of the Bible and find that this tension is being set up for us. This very good foundational question is being asked, and it’s being answered, and then it’s ultimately being answered in Christ. Hansen: I can’t resist this question which was off script. Those are the best ones, right, to the question asker. Hansen: You are in Dallas. Hansen: How much when you’re starting with a place like Genesis do things like major theological systems come into play when you’re trying to teach a book like Genesis? Wilkin: Well, they certainly do, and in fact, that was the number one question that I would get when people heard that the study was coming out, it was, “What position are you going to take on the age of the Earth?” And my answer is that, “I’m not.” I’m gonna give you what the most commonly held views are that we would say fall under orthodoxy, and then it’s actually not my job to solve that for you. My job as someone who wants to handle the text correctly is to ask and attempt to answer the questions that the text is interested in asking and answering, and Genesis is profoundly disinterested in asking the “how” question of creation. It is deeply interested in answering the question of why and who. And so, it’s faithfully establishing that God creates and that He does so for his glory, and that He does so in an orderly manner. And so, those are the questions that we’re gonna spend time on because what I have found so often in any discussion about Genesis is we get so mired down in arguing about what is really a secondary consideration, although I know people will take issue with that, that we miss what the primary thrust of the text is. And it’s fine to have a strong opinion on the age of the Earth. I don’t share mine because the second that I chose one of those and articulate it, I’ve given half the room permission to ignore whatever else I’ll say because they wanna write me off because of that. And I actually believe the text is extremely beautiful in so many other ways without even getting into that discussion, that we should be able to, regardless of what our church background is or our position on that, we should all be able to come to this text and ask, “What can everyone agree is beautiful about it?” And so, that’s the way that we focus the study. Hansen: What a great example of where in-depth Bible study can benefit in part when you’re able to bring in together some of the other considerable aids that we have and you’re able to compare Genesis from some of the other contemporary literature. It really sheds a lot of significant light on what’s different with that which often then shows us what the, you know, the purpose is of that writing, what questions it is trying to answer. So, that’s one of the things I teach on Christ and Culture in a number of different places, and I don’t think people give proper attention to how conditioned they are when they come to scripture. Hansen: None of us can avoid that, but that we impose so many different things on scripture even when we come to it with an orthodox intent or a conservative intent. And, again, that’s not altogether bad, in some sense it’s unavoidable, but I think we can be ignorant of it when we say, “I just believe the Bible,” like except for all of these unspoken theological assumptions and structures that you are imposing here, and all these questions that you’re asking and demanding of the text that actually the text is not trying to answer for you, or at least in that way. Wilkin: Yeah. It’s a challenge. Hansen: Okay. A couple of final questions, one that I know is near and dear to your heart, a big picture here. Evangelical churches are notoriously fad-ish unfortunately, Sunday school for many years, that was the rage, that was an innovation at one point, vacation Bible school, likewise, small groups. I wonder, rather than just following whatever seems to work at the church down the street and that we should copy, helps us to understand how we can reclaim Christian education as the proper calling of the local church. Wilkin: That’s a really big question, and it’s one that we’ve been trying really hard to answer faithfully at the village. You know, the most recent trend probably, at least in a lot of the churches that I have contact with has been a move to place the whole burden of discipleship on small groups, whether you call them community groups, or home groups, or whatever. So, that’s an organic ministry model. And organic ministry models are good for many things. They are very tough as educational environments. And the funny thing about Sunday school is like when we all dumped off Sunday school, arguably it was because it was no longer accomplishing what it had accomplished initially. But what it had accomplished initially was it removed as many barriers to entry for people, to sit in a learning environment, and then it sort of raised the bar on what it asked of them while they were there. And so, at the point that Sunday school was being offloaded by churches, it had turned more into just, you know, surface level discussions around the curriculum that we had gotten from our denomination or something like that, but the structure itself was something that was actually lifted just from any education system. So, I think what we’re hoping to do at the village is reclaim what we call dedicated active learning environments. So, their primary state of purpose is learning, whereas in a community group or a home group often the primary state of purpose would be community. So, it’s not that we don’t wanna have community in these environments, but we’re just not going to make it the highest stated value. So, we’re trying to carve that space for people to think about the text, but not just to think about it, but to…so, we want to develop thinkers, but we also want to develop people who are workers in those environments. In other words, they are doing some of their partnering in the work of learning, and the most common spaces that we see in churches today are passive learning environments. And it’s not just churches, it’s podcast, and it’s books, or whatever. It’s anywhere that you’re sitting and receiving what someone said about the Bible. But you yourself have perhaps spent little to no time in the text before you hear teaching over it. So, what we’re looking to reclaim are spaces where you spent time wrestling with the text yourself around some good sets of tools, and then you discuss what you’ve been learning with your peers at a thought level, so not a feelings level but at a thought level. I mean, the feelings part will come, but it needs to come at the right place in the process. And then you sit and hear teaching from someone who is gifted and equipped to teach, but you do that only after those first two steps have taken place because that way you have had to flex your own muscles around this, and you hear teaching so differently when you hear it over a passage that you’re familiar with, or that you’ve had to wrestle with, than you do when you just hear teaching over passage that’s read before the teaching occurs. Hansen: Yeah. I mean, that’s an inspiring model. It’s one that my own church is going through, and it reminds me we need to swap some notes at some point. Hansen: We’re actually moving a little bit more toward something of these learning environments that you’re describing right there. And one of the things I’ve done is tried…I mean, it’s hard in a Sunday school kind of context, some people, like you can tell them that they have homework, I have a hard time enforcing that for any number of different reasons, but you’re exactly right. When you come in cold to a fairly complicated and time constrained situation, discussion, you can gain some things, but not nearly as much if you’re actually preparing your mind for that. Wilkin: And you won’t retain the same amount either. And so, that’s what…I mean, my favorite thing, you know I teach lots of places, but my favorite place to teach is in that study in my local church because they come so primed for the teaching because they spent a whole week asking and trying to answer some hard questions and they’re ready to have that. They want me to relieve the tension that’s been built up. And so, I can do so much more in the teaching time. They can do so much more in the teaching time. It’s really satisfying. But in order to have those environments work, you have to have structure, and you have to have predictability around it in order to get…because what we have to do is we have to earn people’s trust, that they opt into this environment, it’s going to be worth their discretionary time investment. And I think that the false message that the church has told itself is, “Oh, our people won’t do that.” Like, everybody is busy, I hear this all the time, everybody is busy. The people in my setting, “Jen, you just don’t understand my context. Our people won’t give more time to the church than they already are.” And I don’t see that as playing out in my setting, but I would just say people have discretionary time and they give it. They give it lots in places, they give it to whoever they know they can trust to make it worth their while. They trust their personal trainer with their time because they know exactly what they’re getting and what it will yield, and they know exactly when it meets and how it’s gonna happen. And so, the more that the local church sort of rouses it’s collective memory around giving structure, and predictability, and accountability in its learning environments, the more we’re likely to reclaim some of these precious discretionary time and devote it to the purpose of discipleship. Hansen: Amen. Last question, I like this one, I got to credit my colleague, Betsy Howard for this question. If you could choose one character from the Book of Genesis to be on staff with you at the village church, which one would you choose and why? Wilkin: I would choose Joseph. Hansen: Oh, that’s the easy one. Okay. I wanted to see what you would do with, I don’t know, with Abraham, but that’d be kind of scary. I wouldn’t trust Abraham. Wilkin: No, the way Abraham kept sending Sarah into [inaudible 00:32:34] Pharaoh, no. Wilkin: No. The thing I love…yeah, I love…the problem with Joseph is he’d be constantly Jesus-joking you in the office, but other than that he’s just dreamy. I mean, he’s great. There are so many parallels between his character and Christ. And he’s humble, and he flees from sin, and he, you know, he ends up…he’s humbled, and then he’s exalted, and then there’s bread for the world because of his position, and I mean that whole last part where he keeps breaking down and crying when his brothers are there. And he’s just great. I like that guy a lot. Honestly, I don’t know that he’d make a great co-worker, but [inaudible 00:33:19]. Hansen: He could really run the whole place, I suppose. He’d be qualified. He managed an entire empire, I suppose. Hansen: That would be fine. Wilkin: He’d seem to have some administrative skills, that most churches won’t benefit from. Wilkin: There’s a double entendre there, the dream [inaudible 00:33:55]. Hansen: Exactly. Not subtle, but entirely appropriate. My guest in the “Gospel Coalition” podcast has been Jen Wilkin. 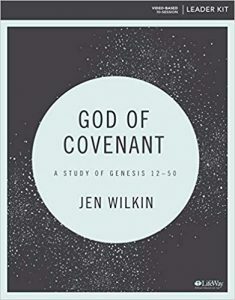 Her latest Bible study published with LifeWay, “God of Covenant: A Study of Genesis 12-50.” Thank you, Wilkin. If anything distinguishes evangelicals from other religious groups, it’s Bible study. And yet you wonder sometimes if it’s something we like to talk about more than do. Unless it’s debating things like creation. That’s always a favorite past-time for evangelicals of all ages. Jen Wilkin is a gifted Bible teacher and veteran advocate for Bible literacy in the church. And she’s not afraid to tackle the hard topics, which start on the first page of Scripture and continue all the way through to the end, from Genesis to Revelation. Her latest Bible study published with LifeWay is God of Covenant: A Study of Genesis 12–50. Jen joins me to talk about Genesis, Bible teaching, parenthood, Christian education, and more.